the 40 mpg mark and in a few cases more, after years of costly development and continuing market hype. Electric only autos coming on scene require a place to plug in. But the TDI (for turbo diesel injected) version of Passat rips off a cool 31/43 miles to the gallon of diesel fuel with manual transmission, or a no-slouch 30/40 with automatic, all riding on a 2.0-liter, 140-horsepower inline four. The Selective Catalytic Reduction System ensures this earth friendly clean diesel vehicle meets the emissions requirements of all 50 states. 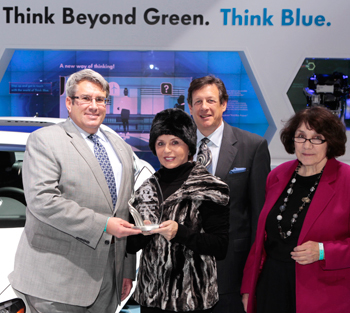 “The 2012 VW Passat TDI beat out its competition by a landslide,” said Caldwell. "The vehicle not only is fuel efficient and eco-friendly, but its styling, performance, power and pricing leaves one feeling like they’re driving a high performance vehicle with no tell tale signs of lag or noise that other diesel engine vehicles tend to still leave behind." What are some of the other factors that contributed to the Passat's win? There are no dead weight batteries in Passat's trunk, just room for plenty of suitcases or other cargo. There's no range anxiety from a search for the nearest power plug. There's no wondering if a needed mechanic in the next town could fix an unexpected problem with a strange new technology if something ever happened far from urban civilization. The Passat doesn't announce its instant fuel gains with flashy instrument panel gizmos. During testing, we felt so comfortable and mainstream in our test Passat that we easily forgot we could drive it nearly 800 miles without having to refuel, thanks to the 18.5 gallon fuel tank. (There's no space constriction from oversized batteries.) In fact, Passat's numbers are not matched by any other comparably sized sedan because of the clean diesel powerplant, according to VW Even the barely audible diesel purr (with windows down) is forgotten, while handling is as responsive as a gas powered model. 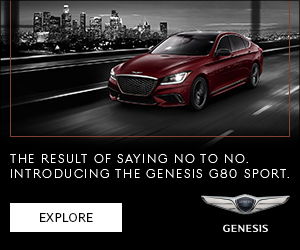 And what kind of amenities does this clean diesel auto offer compared to a gas-stingy or electrically-augmented counterpart? Size is immediately noticeable. The Passat has more interior room than sub-compact hybrids that can eke out similar mileage stats. Torque, that driving force that overcomes the inertia of being at a standstill and propels the auto into its get up and go, is 236 lb-ft.
VW's turbo-diesel Passat does cost more than the standard gasoline base model that grazes just below the $20K level. The base diesel (manual) starts at $25,995, but includes leatherette seating, heated front seats, premium touch screen radio, leather-wrapped steering wheel and more. Factoring in its planet-friendly character, those advantages are among the reasons we honor the 2012 VW Passat. 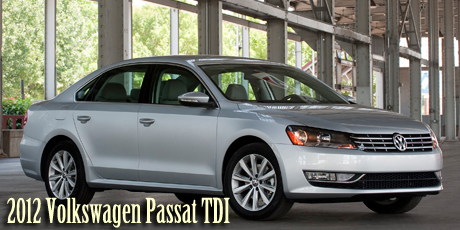 For more info on the Volkswagen Passat TDI, click here. About Earth, Wind & Power Media – The goal of EWP Media (blog, website and awards) is to educate, enlighten, and empower consumers about alternative energy sources such as solar, wind, water and other natural resources so they can make informed decisions on which energy efficient vehicles to buy, improve and change their daily living habits with greener home and garden products and services, explore cleaner travel options such as LEED hotels, and support airlines that are transitioning to fuel efficient planes, as well as other eco-friendly travel options. EWP aims to help educate consumers on where to find and how to use the tools necessary to convert their everyday lives into an organic and balanced state of living with and on our one and only planet. 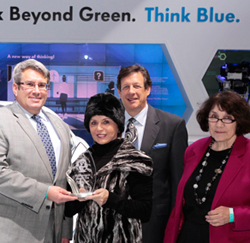 The mission of the EWP Awards is to honor vehicles that are driven by a power source that helps improve climate change by reducing the amount of CO2 emissions poured into the Earth’s atmosphere, promote a cleaner environment, and support the ultimate mission to achieve energy independence through alternative power sources. Vehicles are judged on how environmentally progressive they are in reducing greenhouse gases in the Earth’s atmosphere.